The ultimate goal of medical education is to train and prepare aspiring physicians to respond to the health needs of the general population. Therefore, it is critical that the curriculum presented to learners is globally relevant. Currently, the medical education system in India relies on a curriculum that is teacher centered (e.g., instructors choose content to teach) and time oriented (e.g., emphasis is placed on seat time, as opposed to demonstration of a competency). Both the teaching/learning and assessment activities focus exclusively on the knowledge domain, while the other important domains remain neglected., As a result, medical school graduates have a significant fund of medical knowledge but often lack other skills necessary for modern day clinical practice. Moreover, a decline in the competence levels of recent medical school graduates has been observed., For example, there is evidence of an overreliance on laboratory investigations to reach a proper diagnosis, limited clinical reasoning and critical thinking skills, poor communication skills, and minimal competence to deal with ethical issues., Further, due to the rise in the incidence of physical attacks against doctors, it is imperative that medical education in India also focuses on the affective domain, development of professionalism skills and ethical behaviors, and other neglected, yet crucial, areas. Introduction of competency-based medical education (CBME) in Indian medical schools has the potential to deliver the desired results. More specifically, CBME can help all learners raise their level of competency and be better prepared for the real world challenges that are inherent in the medical profession., CBME, however, is a highly resource-intensive program that requires a large number of resources for its successful implementation. Multiple prerequisites have been identified for the successful planning and smooth implementation of a CBME in medical colleges in India [Table 1]. CBME implementation in India is still in early development stages as the regulatory body for medical education, the Medical Council of India (MCI), has not yet made it mandatory for medical institutions to shift from conventional education models to CBME., Although the need of CBME has been acknowledged for some time, medical colleges have only recently begun to move forward with this transition., Further, some institutions have begun framing the competencies desired for different subjects areas, but the formulation of milestones and assessments is still on hold in the absence of approval and guidance from the MCI. Nevertheless, there is a positive movement toward implementation of CBME in India, as demonstrated by the recent release of Graduate Medical Regulations 2017 that has defined subject-specific competencies that medical students should acquire upon completion of each course. Since 2016, the Sri Balaji Vidyapeeth has adopted CBME for all the postgraduate courses running in two of its constituent medical colleges, namely Shri Sathya Sai Medical College and Research Institute and Mahatma Gandhi Medical College and Research Institute. Faculty members and postgraduate students have been made aware of CBME, and subject-specific entrustable professional activities (EPAs) have been planned. The assessment process has also been introduced using workplace-based assessment tools. For all postgraduate students, an e-portfolio has been implemented in which learning is monitored over time. The initial experience has been encouraging, but many improvements and refinements are needed, especially in the areas of assessment and certification. The MCI has already provided a framework to initiate the implementation of CBME in India. However, the council has not made CBME mandatory. Thus, the use of CBME in India is extremely limited at this time. The first priority to promote change in medical education in India is to design a CBME curriculum and make it mandatory for all medical colleges by a given timeframe. Second, the number of faculty in each specialty would need to be increased for the implementation of CBME., All enrolled faculty would then be required to train on CBME best practices, which has already begun across the nation through various nodal and regional centers for faculty development under the direction of MCI. The basic aim of these workshops is to familiarize faculty members with the advantages of a CBME program and the ways in which faculty can help ensure a smooth transition at their respective institutions. CBME has potential to raise the standards of medical education in India, but it can only achieve this goal if it is supported by intensive planning and support from all stakeholders. Shah N, Desai C, Jorwekar G, Badyal D, Singh T. Competency-based medical education: An overview and application in pharmacology. Indian J Pharmacol 2016;48:S5-9. Kiguli-Malwadde E, Olapade-Olaopa EO, Kiguli S, Chen C, Sewankambo NK, Ogunniyi AO, et al. Competency-based medical education in two sub-Saharan African medical schools. Adv Med Educ Pract 2014;5:483-9. McMahon GT, Marina O, Kritek PA, Katz JT. Effect of a physical examination teaching program on the behavior of medical residents. J Gen Intern Med 2005;20:710-4. Oyedokun A, Adeloye D, Balogun O. Clinical history-taking and physical examination in medical practice in Africa: Still relevant? Croat Med J 2016;57:605-7. Ranjan P, Kumari A, Chakrawarty A. How can doctors improve their communication skills? J Clin Diagn Res 2015;9:JE01-4. Caverzagie KJ, Nousiainen MT, Ferguson PC, Ten Cate O, Ross S, Harris KA, et al. 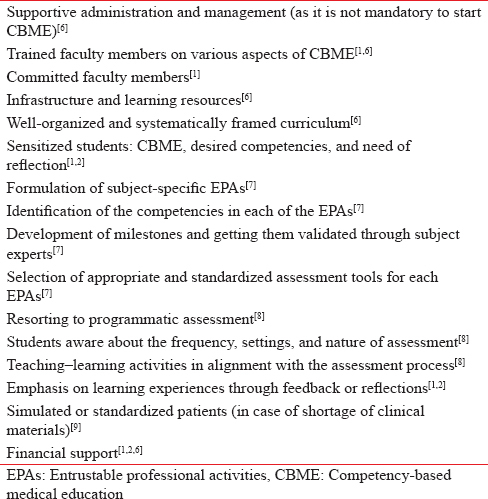 Overarching challenges to the implementation of competency-based medical education. Med Teach 2017;39:588-93. Cate OT. A primer on entrustable professional activities. Korean J Med Educ 2018;30:1-10. Timmerman AA, Dijkstra J. A practical approach to programmatic assessment design. Adv Health Sci Educ Theory Pract 2017;22:1169-82. Solís I, Bozzo S, Kunakov N. Standardized patients in clinical skills training in undergraduate medical education. Rev Med Chil 2013;141:1216-7. Shrivastava SR, Shrivastava PS, Ramasamy J. Development of a module to successfully implement competency-based medical education program in an institute. Muller J Med Sci Res 2018;9:27-9. Medical Council of India. Medical Council of India Regulations on Graduate Medical Education, 1997; July, 2017. Available from: https://www.mciindia.org/documents/rulesAndRegulations/GME_REGULATIONS.pdf. [Last accessed on 2018 Oct 22]. Ananthakrishnan N, Karthikeyan P, Pulimoottil DT, JaganmohanR, Adkoli BV, Ravishanker M, et al. SBV model of competency-based learning and training for post graduate education. Ann SBV 2017;6:5-10. Herur A, Kolagi S. Competency-based medical education: Need of the hour: Let's do our bit…!!. BLDE Univ J Health Sci 2016;1:59-60. Foster D. Technology, innovation, and progress in testing: Eight barriers to change. Educ Health Prof 2018;1:4-6.